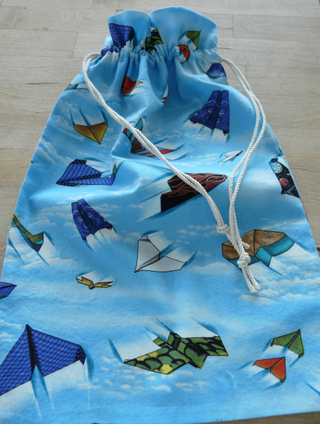 Paper Airplane Drawstring Bag to Hold (wait for it...) Paper Airplanes! Isn't this fabric fabulous? I mentioned that I started this bag when I got sidetracked by making a fabulous fabric paper airplane. I finished it and Aidan loves it! This bag is now part of our clean-up routine so Aidan's airplanes aren't littered all over the house. I love making drawstring bags. I made this bag using a pattern in Nancy Zieman's Sew Gifts with Love. I really like Sewing with Nancy. She's a local gal and very clever and a good teacher. I have to admit they usually use some ugly fabric (what is up with all the batik, too?) but the tips are fabulous. She had a great episode on making your own chenille that I really loved. Plus, they always do some kind of creative kindness segment. So sweet. Anyway, the pattern is easy and fun and I would use it for all but small drawstring bags. That fabric is so cool! And a brilliant way to clean up all those great planes. Cute bag, Sadie, and cool airplane!